A portal consists of several components, as shown in the following diagram. Component 1 - Top Bar. The Top Bar is one of three components that can contain the Menu Bar. The Top Bar appears as a component on a portal only if it contains the Menu Bar. The Top Bar cannot contain any item other than the Menu Bar. Component 2 - Bottom Bar. The Bottom Bar is one of three components that can contain the Menu Bar. The Bottom Bar appears as a component on a portal only if it contains the Menu Bar. The Bottom Bar cannot contain any item other than the Menu Bar. Components 4-7 - Banner Areas. Banner areas are the equivalent of headings and footings in a document. They are always present in the portal no matter what page you are on. They can appear on the top, left, right, and bottom of the screen, as shown in the preceding diagram. Each banner area is optional. Banner areas can contain any type of content available in the BI Portal. A banner works just like a page. It has the same layout options described in Pages. The Top Banner may appear as a component on a portal whether or not it contains the Menu Bar. Component 8 - Navigation. 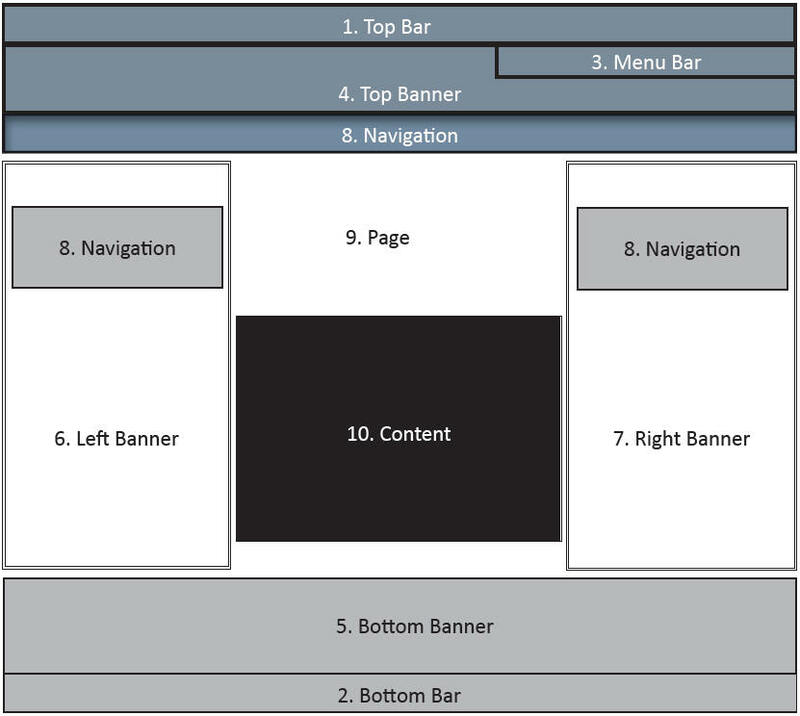 Relative to the page area, the navigation menu can appear on top, to the left, to the right, or not at all. Component 9 - Page. This is the area in which actual content is placed. Within this area, you have panels containing content. Component 10 - Content. This is the actual page content that exists in different containers that can hold any items, from text to reports.